Macarons are a light, airy French sandwich cookie with a tasty filling. The exterior is made from a nut meringue while the interior of the cookie can be any type of filling you'd like. Because of the similarity in spelling, many people confuse macarons with macaroons, which are a chewy coconut cookie, but the two are quite different. Making macarons is a technical process that requires careful attention to detail, but the delicious results make the effort worthwhile. 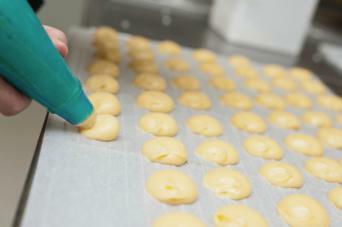 The exterior of macarons is a light nut meringue that is a mixture of egg whites, sugar, and almonds. It is important that you grind the nuts as finely as you possibly can to keep the meringues light and airy. With the basic recipe in place, you can customize the cookies by adding different colors and flavors to the nut meringue. Preheat your oven to 350 degrees Fahrenheit. Line a baking sheet with parchment. In a food processor, process the almonds and powdered sugar, making a fine powder. This usually takes about one minute. To further refine the almond mixture, use a rubber spatula to press it through a fine-mesh sieve. If any solids remain in the sieve, process them in the food processor again for another 30 seconds. Press those through the sieve, as well, repeating this process until all the mixture passes through the sieve. 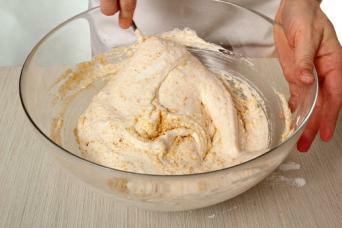 In a large bowl (or in the bowl of a stand mixer), whisk together the egg whites and sugar. Make sure the bowl and egg whites are completely free of any fat, such as bits of egg yolk or fatty residue from another use. After whisking for one minute to combine the sugar and eggs thoroughly, use an electric or stand mixer fitted with a whisk attachment on medium to continue to whip the egg white and sugar mixture for two minutes. Turn the mixer up to medium-high and beat two minutes more. Turn the mixer up to high and beat for another two minutes. Beat until the egg whites hold stiff peaks when you lift out the whisk. If you are adding flavoring or coloring, add the desired amount here (see the variations section below) and beat for an additional 30 seconds on high to incorporate. Fold in the almond/powdered sugar mixture, using about 40 strokes to combine it well. The mixture will be viscous but still airy. Carefully spoon the mixture into a pastry bag fitted with a 3/8-inch round tip. Pipe the cookies in 3/4 inch circles onto the parchment-lined baking sheets. Leave spacing of about one-inch between each cookie, as the cookies will expand. Hold the pans firmly along each side and tap the bottom three times on the counter to remove any air bubbles. Bake the cookies in a preheated oven with the rack set in the middle of the oven. Bake until the cookies rise and are firm, 12 to 14 minutes. Rotate the baking sheet 180 degrees (turn it front to back) halfway through cooking. Filling for macarons can be anything, really. Many people like to use jam or preserves as filling, which is really easy to do. If you'd like a creamier filling, then you may like either this light and airy Swiss meringue buttercream recipe or a cream cheese icing, as well. Swiss meringue buttercream is light and fluffy, which fits perfectly with the airy nut meringue cookies. Fill a pot or large saucepan with a few inches of water and bring it to a simmer. In a bowl or the bowl from your stand mixer, whisk together the egg whites and sugar until well combined, about one minute. Set the bowl over the pot of simmering water. Whisk every 30 seconds or so, continuing until it is warm and the sugar dissolves, three to five minutes. Make sure the water doesn't warm to above a simmer. Once the sugar has dissolved completely, transfer the egg and sugar mixture to the stand mixer fitted with a whisk attachment, or take it off the water and use your hand mixer fitted with whisk attachments. Begin whipping the eggs and sugar on high until the mixture is shiny and stiffens, three to five minutes. Now, working one piece at a time and leaving the mixer on high, continue adding butter one piece at a time until it is completely incorporated in the mixture. If you choose to add color or flavoring, mix it in here using the whisk until just combined, about 30 seconds. Filling the macarons is as simple as lightly spreading one tablespoon of your filling on one cookie in an even layer or piping it onto the cookie using a round tip and smoothing it with a knife. Then, top it with a second cookie. If you don't eat them right away, store the macarons tightly sealed in an airtight container such as a zipper bag or Tupperware in your refrigerator for up to seven days. Bring them to room temperature before serving. 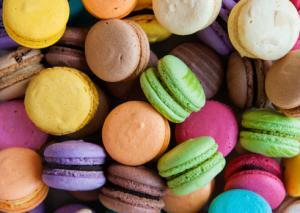 With the basic recipe in place, it's easy to vary the flavors and colors of your macarons. To add colors to macarons and fillings, add three drops of your desired food coloring to your meringues and filling where indicated in the recipe. Add almond extract to the meringue and orange extract to the filling. Add coconut extract to the meringue and rum extract to the filling. Add vanilla extract to both the filling and the meringue. Add lemon extract to the filling. You can enhance flavors with nuts and cocoa powder as well. Add 1/4 cup cocoa powder to each the filling and the meringue for chocolate. Add finely chopped nuts, such as pistachios, to the filling, folding it in just before filling the cookies. Add a few tablespoons of honey or pure maple syrup to the filling just before filling the cookies. Add 1/4 cup cocoa powder to the meringue and then fill it with peanut butter ganache. Flavor the meringues with almond extract and fill the center with chocolate ganache. 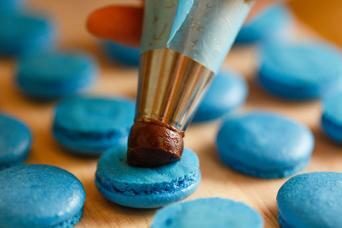 Consider the following tips when making macarons. Always start with egg whites at room temperature. Butter should also be at room temperature. With your egg whites, make sure they are completely free of any bits of egg yolk, as fat can keep them from whipping properly. When whipping your egg whites, start with a very clean bowl and whisk, making sure there isn't any oil or fat residue on them. To keep the parchment from lifting at the edges when it's on the baking sheet, dab a bit of the meringue in each of the four corners of the bottom of the parchment and press it down into the pan. The meringue will act as glue. Sure macarons are a bit technical, but so is all baking. Once you get the basic method down, however, it's a relatively easy process to repeat and customize to your own tastes. With a little creativity, you can make all kinds of delicious, delicate cookies.